Author(s): Darakhshan Jabeen Haleem. Neuroscience Research Laboratory, Dr. Panjwani Center for Molecular Medicine & Drug Research (PCMD), International Center for Chemical and Biological Science (ICCBS), University of Karachi, Karachi 75270, Pakistan. The increasing prevalence of both obesity and depression is becoming a significant health concern throughout the world. Evidence suggests a positive and bidirectional association between obesity and depression. It is now well established that central serotonergic system is involved in the elicitation of satiety signal and elevation of mood. Drugs that increase serotonin neurotransmission are commonly recommended for the treatment of depression. But many patients are not benefitted by these drugs, while remission rate is also not satisfactory. Serotonin based antiobesity drugs have been either withdrawn from the market or disapproved for long term use. 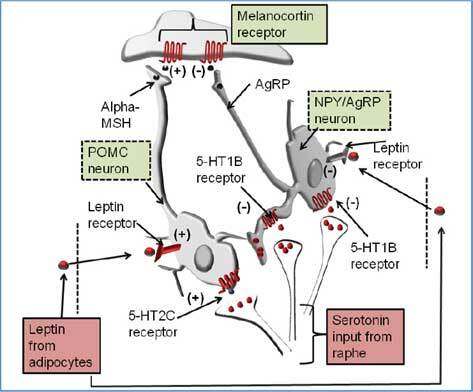 In view of critical need for novel therapeutic targets for obesity and depression, the role of leptin is becoming increasingly important. The peptide hormone secreted by adipocytes can cross blood brain barriers to elicit satiety signal via its receptors in the hypothalamus. Emerging evidence suggests that the peptide hormone has a role in responses to stress and produces antidepressant like effects. On the other hand, both obesity and depression are often associated with higher levels of leptin in circulation suggesting insensitivity to leptin. The aim of the present article is to draw research interest towards exploring mechanism involved in leptin resistance. These studies may facilitate the development of alternative treatment strategies, beyond serotonin based drugs, for obesity depression and their comorbid condition. Keywords: Obesity, depression, serotonin, leptin. Affiliation:Neuroscience Research Laboratory, Dr. Panjwani Center for Molecular Medicine & Drug Research (PCMD), International Center for Chemical and Biological Science (ICCBS), University of Karachi, Karachi 75270, Pakistan. Abstract:The increasing prevalence of both obesity and depression is becoming a significant health concern throughout the world. Evidence suggests a positive and bidirectional association between obesity and depression. It is now well established that central serotonergic system is involved in the elicitation of satiety signal and elevation of mood. Drugs that increase serotonin neurotransmission are commonly recommended for the treatment of depression. But many patients are not benefitted by these drugs, while remission rate is also not satisfactory. Serotonin based antiobesity drugs have been either withdrawn from the market or disapproved for long term use. In view of critical need for novel therapeutic targets for obesity and depression, the role of leptin is becoming increasingly important. The peptide hormone secreted by adipocytes can cross blood brain barriers to elicit satiety signal via its receptors in the hypothalamus. Emerging evidence suggests that the peptide hormone has a role in responses to stress and produces antidepressant like effects. On the other hand, both obesity and depression are often associated with higher levels of leptin in circulation suggesting insensitivity to leptin. The aim of the present article is to draw research interest towards exploring mechanism involved in leptin resistance. These studies may facilitate the development of alternative treatment strategies, beyond serotonin based drugs, for obesity depression and their comorbid condition.